At Fosh Catering we take care that each of our catering services for events is exclusive for each of our clients. We recently had the pleasure of working at the Biniagual farm for an event in collaboration with Prelude Events. A magical place with charm. At the entrance, the old wooden tables were arranged along the way so that the guests could enjoy a snack upon arrival and relax while chatting. The space, decorated with very earth elements such as baskets of raffia that had ornaments such as plants and flowers that brought colour to the tables. The paved floor, the vegetation, the stalls that imitated a vintage market and the details that hung everywhere. All this helped to create a special environment where all the guests enjoyed the cocktail. At nightfall, a set of garlands that surrounded the farm was responsible for giving light to the ambient. The result? A warm environment that made no one want to leave the party. All of these details that are also trend in this 2018 were reinforced by Marc Fosh Catering service. A cocktail-type menu was available to our guests throughout the day. It is made with quality products and by the hands of the best professionals in the sector. They had the pleasure of cooking live in front of our guests. The result? A fusion of traditional Mediterranean cuisine and modern cuisine. We turn the classic snacks into a delicacy made with haute cuisine techniques and gourmet products. Do you want to celebrate a wedding or an event in Mallorca? 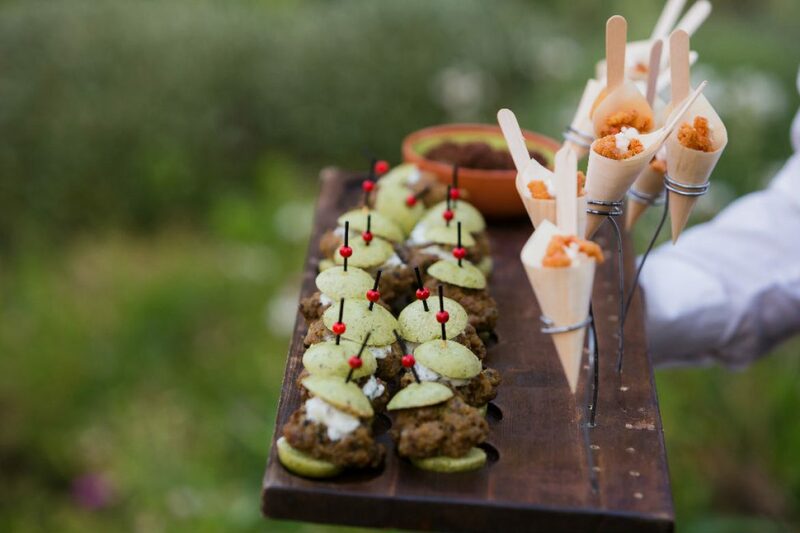 In our section of farms, you will find the best places of the island and, in services, you will find all the possibilities of our catering, which we customize for you. Contact us now!